This website was started in 2007. There are several million alligators in the U.S., but only about a thousand crocodiles. and some of its teeth protrude visibly even when its mouth is completely closed. a year." -- from The Decatur (Alabama) Daily News. 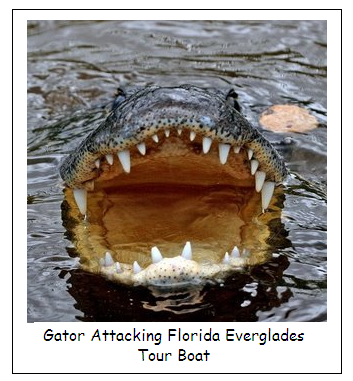 Florida Wildlife Commision pamphlet on alligator safety. Singing "Hey, Alligator" you can't catch me.!" 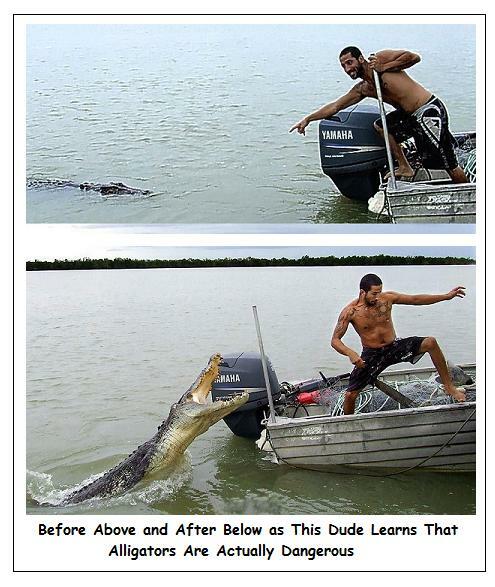 Alligator jumped and caught him instantly. to a children's counting song. 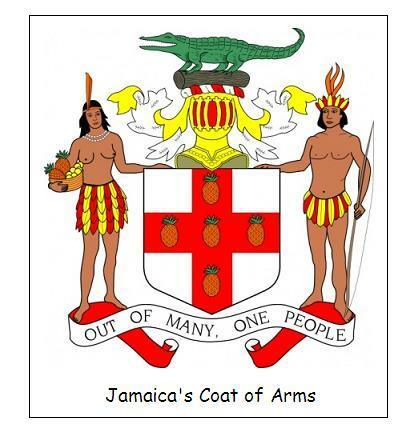 settlers transformed the Spanish name into alligator. 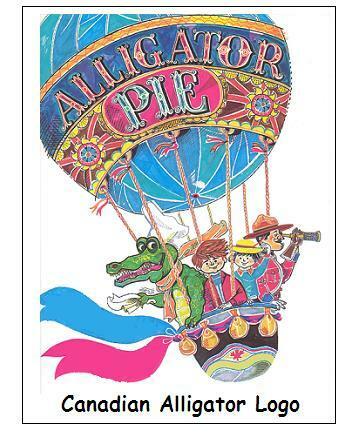 See ya later, Alligator! 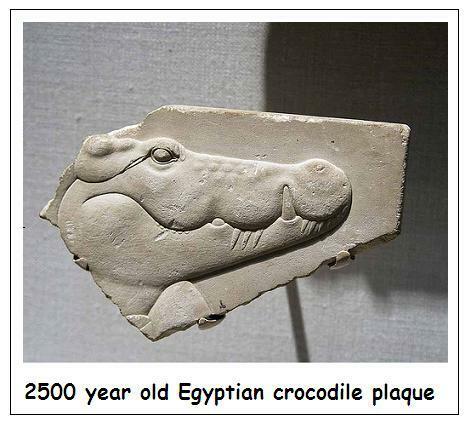 After while, Crocodile! -- The familiar lyrics from an old rock and roll song. 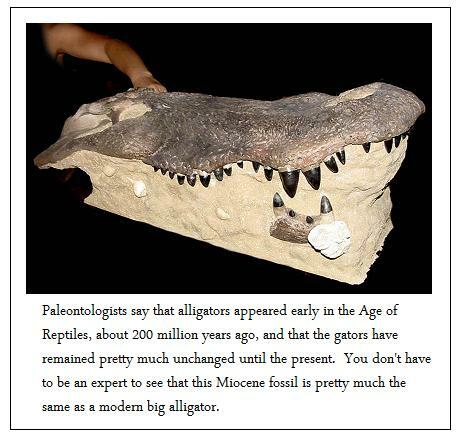 "An alligator is the closest thing to a dinosaur you can find on earth today." 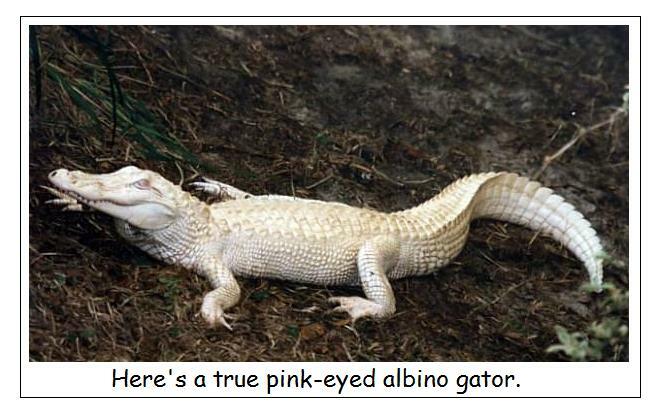 -- From an exotic reptile dealer's ad. 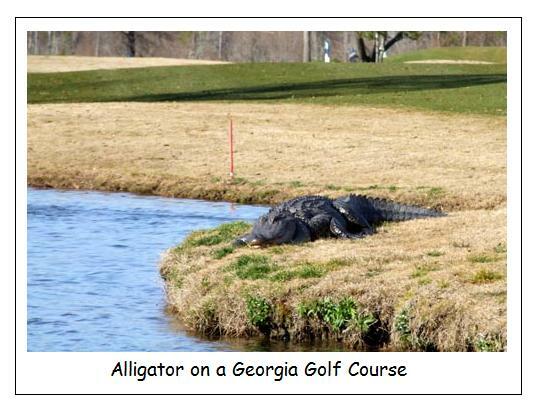 Perhaps global warming is to blame because the warmer the climate becomes, the more areas there are that become alligator-friendly; but, as you will see below, more and more alligators are turning up in unexpected places, even right here in Jefferson County (Alabama). 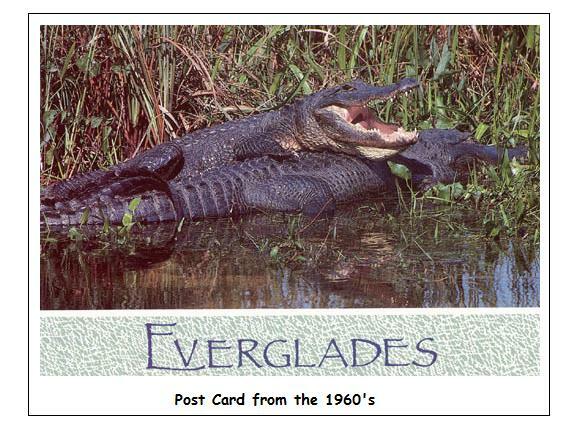 It's not that gators are exotic invasive species like pythons in the Everglades. 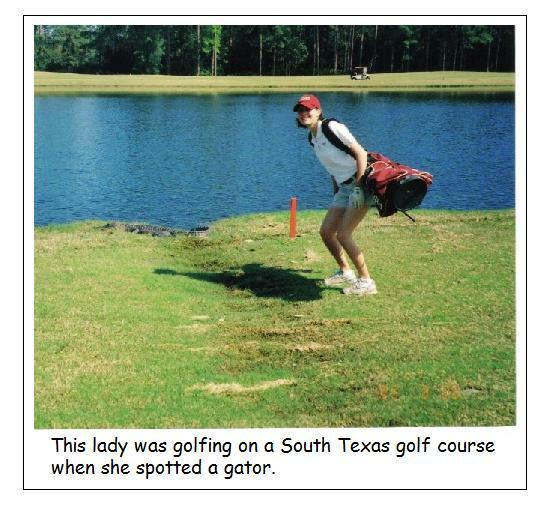 Gators are native to the southeastern U.S. But the fact is that we are hearing about alligator encounters more and more frequently as more and more of their habitat is being turned into subdivisions and industrial areas and golf courses and canal-side jogging paths and supermarket parking lots and Little League ball fields and -- well, you get the idea. 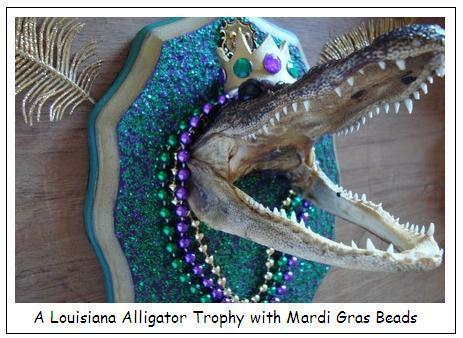 The gators are even turning up pretty frequently on Gulf of Mexico and Atlantic Ocean beaches. 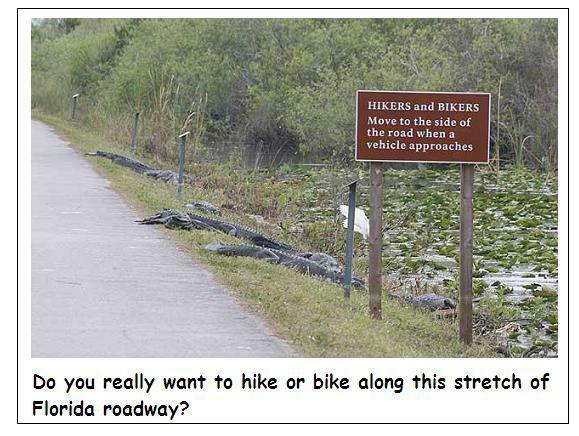 As one source puts it, "we are encountering alligators more often nowadays because we are moving into their habitat." 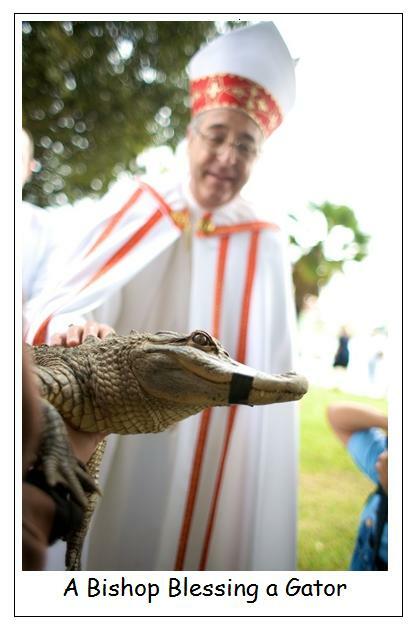 Also we continue to hear about people of questionable sanity who try to raise alligators as pets. When the gators get too big to feed economically or even to deal with safely, their owners often release them into the wild. 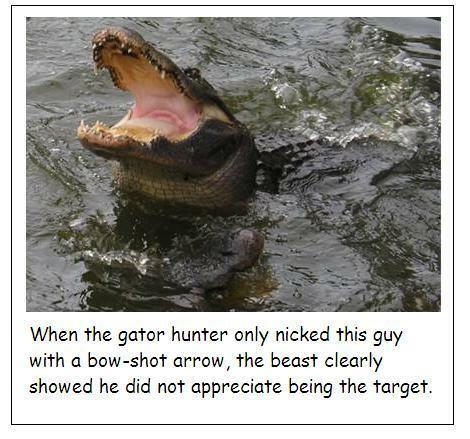 And sometimes a beast as large as a gator sometimes just escapes on his own. 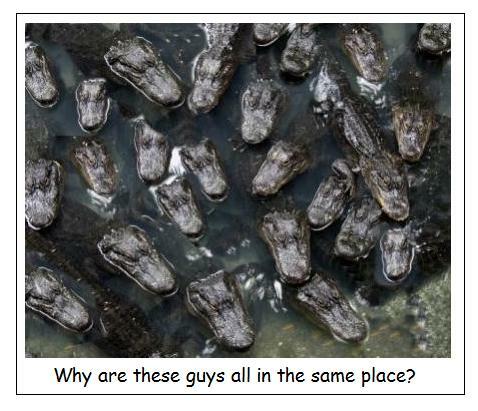 That's why so many communities and states have laws prohibiting private ownership of alligators. Almost every day there are alligator sightings that eventually turn out to be sightings of released or escaped pet alligators. We also hear frequently that floods and hurricanes can and have washed gators many miles away from their normal habitat. 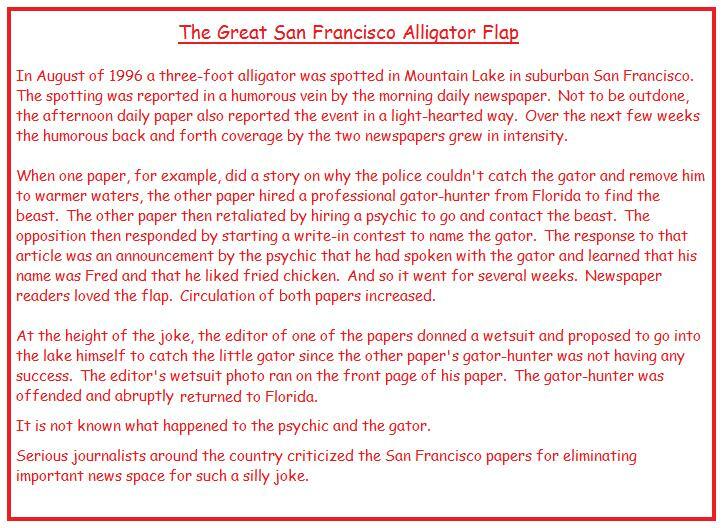 What follows below is a journal/scrapbook of what I see in the news and on the internet about gators, crocodiles, and caimans. I update this page regularly. 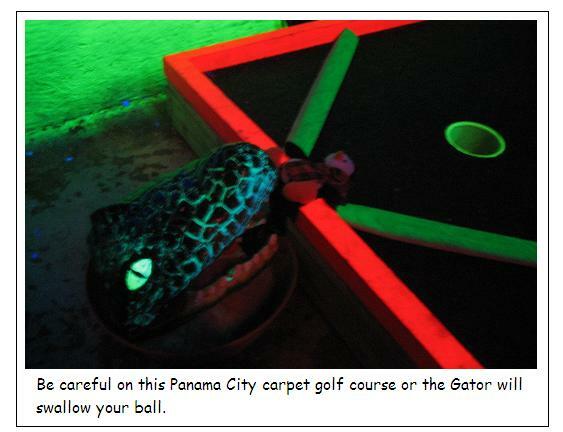 After reading what follows below, golfers and fishermen and beach-goers and joggers along waterside running paths may agree with the idea that they need to be on the lookout for alligators. By the way, the text printed in green always refers to Alabama specific items. 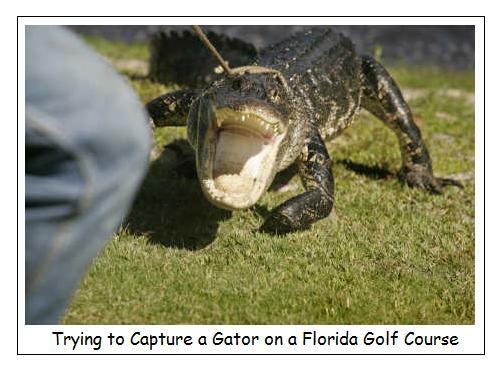 October 12, 2011 (Blue Springs State Park, Florida): Three men from Volusia, Florida, have been arrested for attempting to remove an alligator from a state park. They were armed with shotguns and a .22 rifle, they got lost in the pre-dawn darkness, they stumbled into one another, and they startled each other into firing their weapons. The one with the .22 rifle managed to shoot himself in the foot -- twice! The authorities also are planning to charge the trio with firearms violations (for example, possession of weapons in a state park, minor in possession of a weapon, discharging a firearm in a state park, and so forth) as well as the alligator stealing charges. They even plan to charge the two older guys with contributing to the deliquency of a minor since the third man was only 17. Are you surprised? 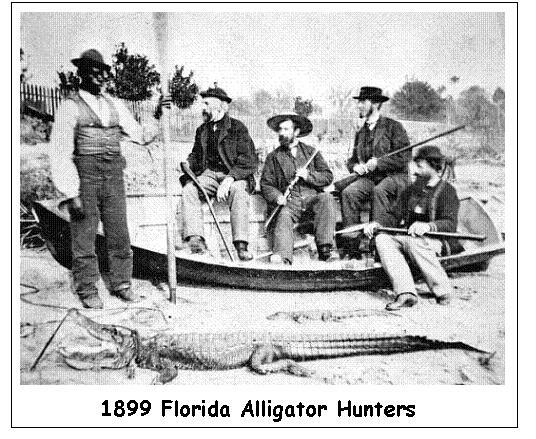 Only idiots would hunt for gators on a dark Florida night. 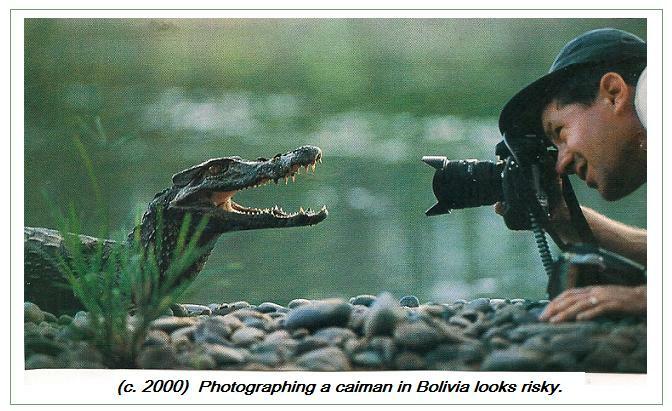 October 12, 2011 (Slickville, Pennsylvania): Zoo officials are trying their best to capture a large alligator that has made the Slickville Municipal Water Reservoir its home. Much to their dismay, numerous local residents who fish, canoe, and kayak on the reservoir have spotted the beast. 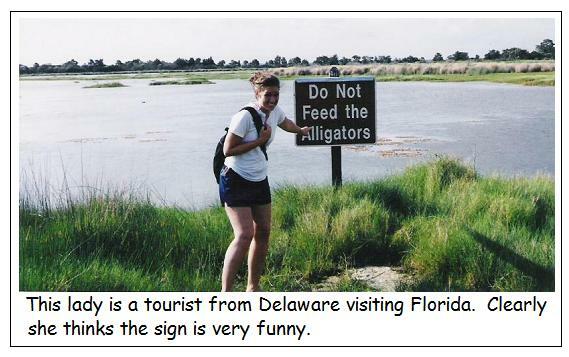 People in Pennsylvania were not used to seeing alligators until people starting setting unwanted pet alligators free. 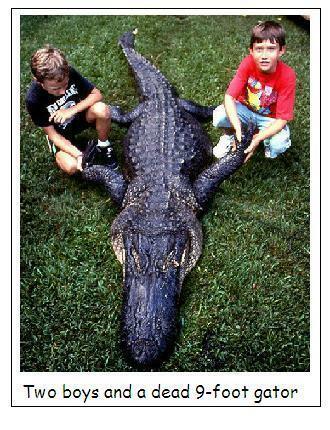 September 16, 2011 (Thomson, Georgia): A 13-foot long gator was removed from private property in Thomson yesterday. Animal control Officer Gillis released the gator in a public lake. and can easily capture, kill, and eat calves, colts, goats, and other farm animals. 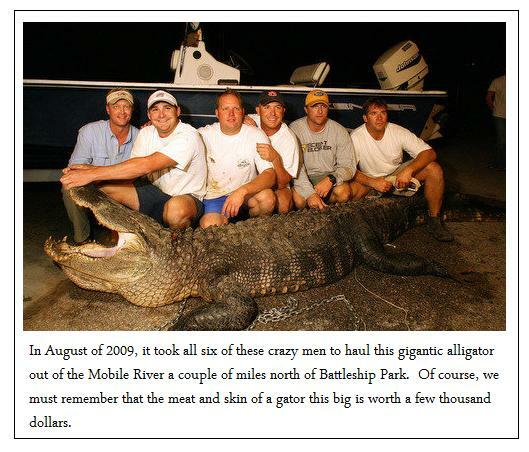 August 21, 2011 (Portland Landing, Alabama): In the Alabama gator hunting season for 2011 Keith Fancher of Sterret and his friends killed the biggest gator ever taken in an Alabama legal gator hunt. Portland Landing is on the Alabama River in Dallas County. 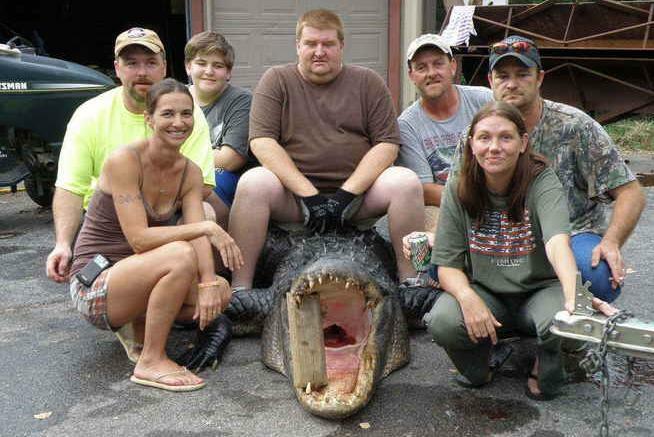 Keith Fancher, friends, and a 14-foot gator that weighed a record 828 pounds. September 17, 2010 -- Mary Ellen Mara-Christian travelled all the way from Massachusetts to Florence County (South Carolina) with her husband and a couple of friends to take part in South Carolina's month-long season for legal hunting of alligators. Well, she hooked a big one! Thirteen and a half feet long! Nine hundred pounds! When she got the gator alongside the boat, her husband shot the gator eight times and then speared it twice before it stopped moving. It took a tractor to move the gator to a nearby processsing plant. Mara-Christian is going to have the animal stuffed. 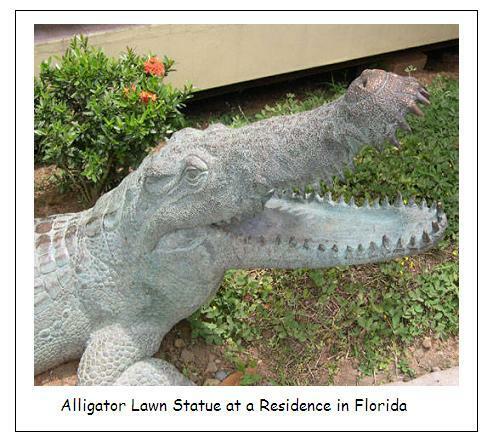 September 13, 2010 -- An Oldsmar (Florida) school crossing guard spotted a seven-foot gator lying beside a stucco wall not far from where little kids were crossing the street on their way to Forest Lakes Elementary School. She called the Pinellas County Sheriff's Department and also called for an alligator trapper. The deputies arrived quickly, but the trapper lived over an hour away. 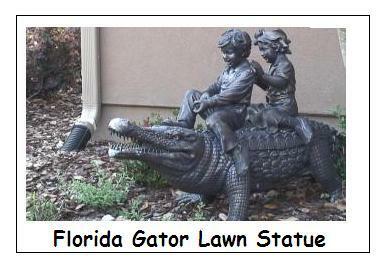 Before the trapper could arrive, the gator started walking alongside the wall towards the cildren crossing the street. The deputies tried to lasso the animal, but it started rolling over and over and thrashing about so wildly that it was knocking chunks of stucco off the wall. The deputies eventually subdued the gator, taped his mouth shut, and handcuffed his rear legs. Then the trapper arrived and removed the beast. No children were injured. 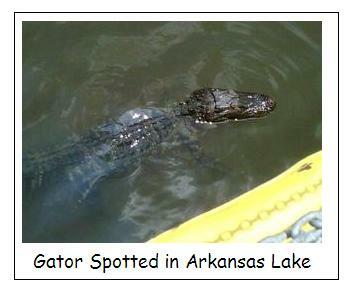 September 8, 2010 -- The three foot alligator spotted in the Rhode Island pond on August 30, 2010, was seen again. 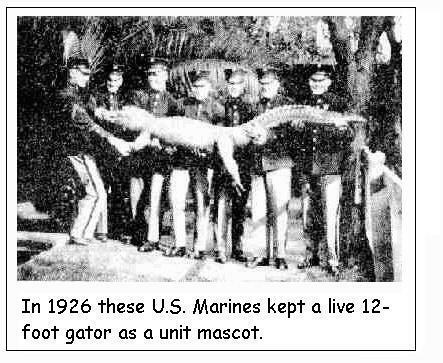 Once again, the authorities failed to capture the gator. 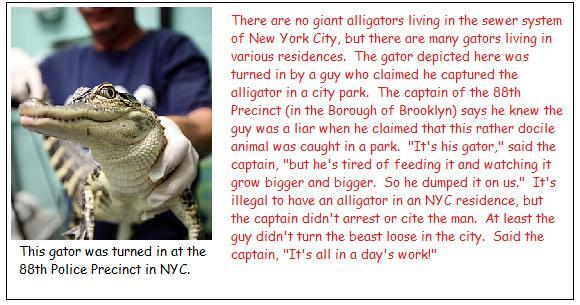 A spokesman said that Rhode Island police don't have that much experience with catching gators. 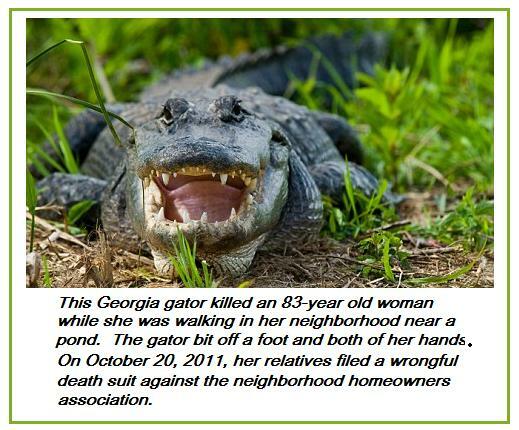 September 2, 2010 -- A woman walking on the grounds of George Washington Middle school in Wayne (New Jersey) spotted a four-foot alligator. The Fish and Wildlife Division was called as well as the Fire Department. The alligator retreated into a drainage pipe and refused to come out. Firefighters flushed him out with a fire hose, captured him, placed him in a cage, and tranported the gator to an animal shelter. A spokesman said it was probably an illegally owned pet that had been released by an owner who no longer wanted to take care of the animal. 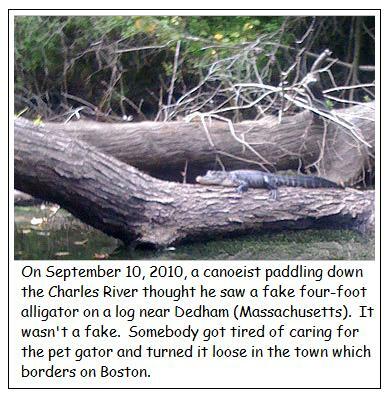 August 30, 2010 -- A 3-foot alligator was spotted in a pond near Portsmouth (Rhode Island). It wasn't caught. 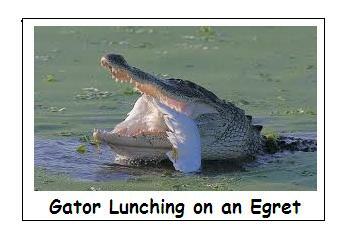 August 25, 2010 -- According to MSNBC's website: Two gators in the Chicago River. One strolling down a Massachusetts street. Another in bustling New York City. And that's just in the past few weeks. From North Dakota to Indiana, alligators are showing up far from their traditional southern habitats -- including a 3-footer captured Tuesday in the Chicago River. But experts say it's not the latest sign of global warming. Instead the creatures almost certainly were pets that escaped or were dumped by their owners. "People buy them as pets and then they get too big and at some point they decide they just can't deal with it," said Kent Vliet, an alligator expert from the University of Florida who tracks media reports about the reptiles. In the past three years, he said, there have been at least 100 instances of alligators showing up in more than 15 states where they're not native. North Carolina is the farthest north that alligators are found naturally, Vliet said. August 23, 2010 -- The Chicago Tribune has recently run several stories on alligators in the Chicago River like the one in the image just above. August 21, 2010 -- Here's part of a letter to the editor of the local newspaper in Lakeland (Florida): "I am a daily user of Loyce Harpe Park (Carter Road park). I walk my dog in the fields and woods and utilize the dog park in the evenings. 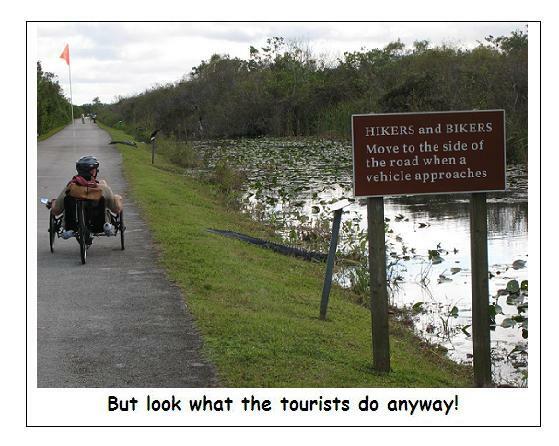 We no longer walk by the water because of frequent alligator sightings on the trails." August 15, 2010 -- The Island Packet, the newspaper on Hilton Head Island (South Carolina), published a letter to the editor by local resident Robert Grunska. Mr. Grunska was angry that nuisance alligators on his island were being euthanized instead of being taken to alligator safe havens. 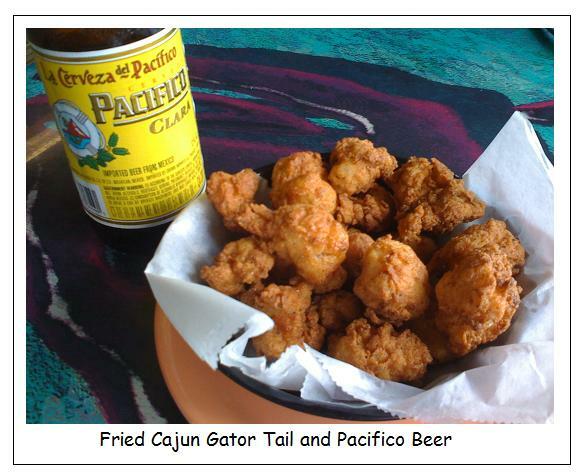 August 4, 2010 -- A teenager fishing on the Patapsco River near Baltimore (Maryland) caught a three foot caiman (the alligator's smaller cousin) using a chicken wing on a fish hook on a string tied to a tree. 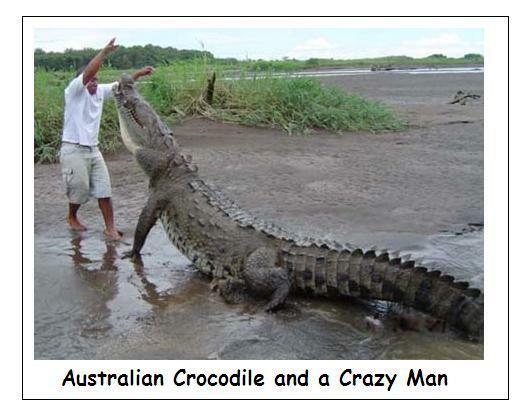 Authorities said that the reptile was obviously released into the area by someone who no longer was able to cope with such a large reptile pet. 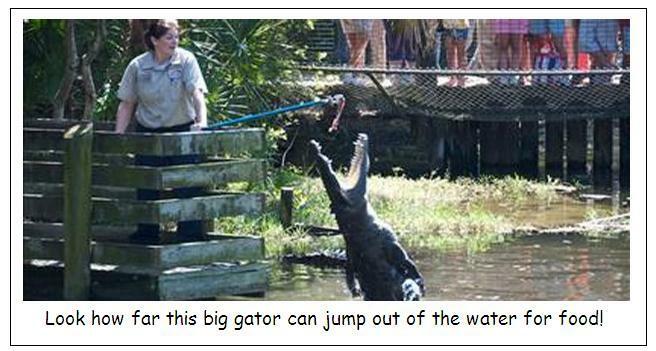 July 29, 2010 -- The newspaper on Hilton Head Island (South Carolina) reported today that an 11-foot gator weighing 500 pounds was found and captured in a lagoon on the resort island. It took three men and a truck to haul the gator out of the lagoon. 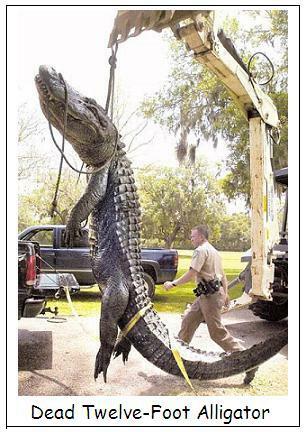 Looking at the image just below this entry causes me to think that the gator in question was much less than 500 pounds and a bit shorter than 11 feet. 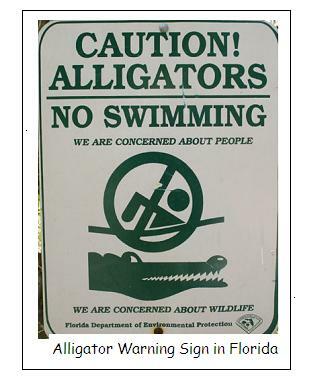 July 29, 2010 -- We are often told that alligators seldom kill or injure people unless the people get too close. 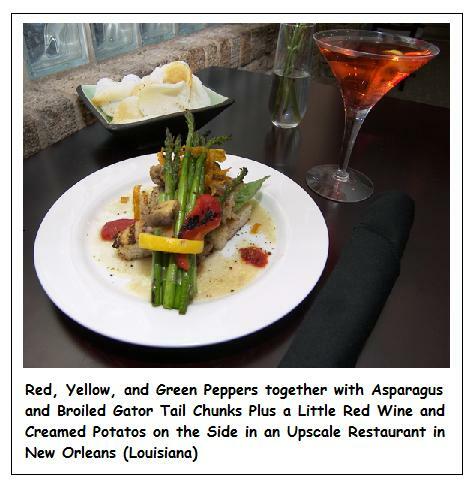 Nevertheless there is a Mississippi website that lists more than a dozen lawyers who include alligator injury law as one of their specialties. 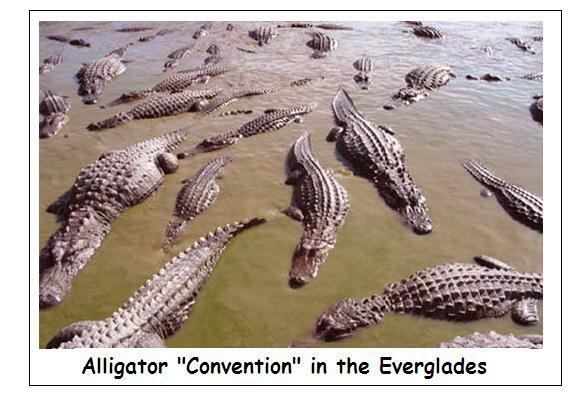 Evidently the Mississippi attorneys think there are enough alligator attacks to make it worth their while to file such lawsuits. 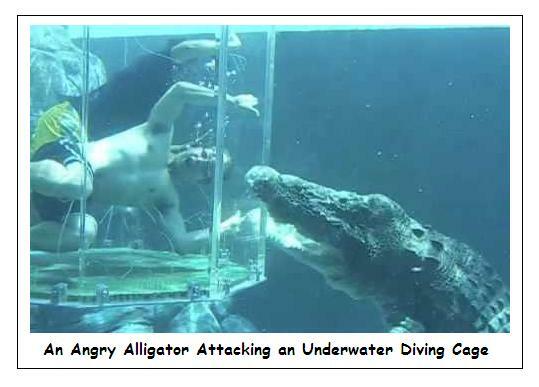 Of course, most sane people think lawyers are pretty much like gators or sharks. 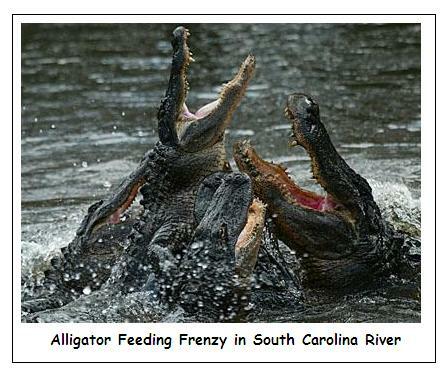 July 28, 2010 -- A new video posted on YouTube shows an alligator feeding frenzy in the Okeefenokee Swamp in Georgia. In a stretch of canal about 30 feet wide and a half mile long about 300 large gators cornered a school of bowfin fish. At the height of the frenzy the water is almost boiling with activity. The fisherman who videotaped the frenzy can be heard on the video exclaiming "That's more gators than I ever saw!" 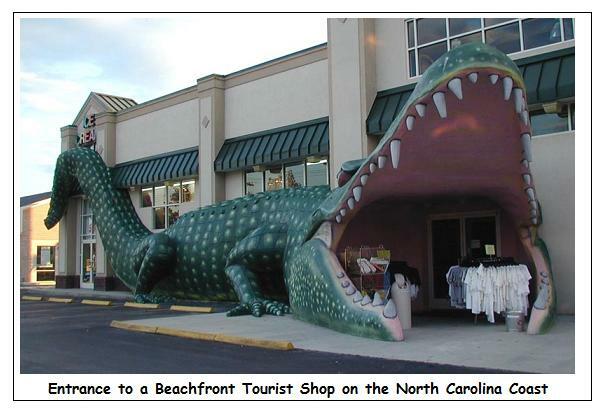 July 28, 2010 -- A family fishing from a pier near Georgetown (South Carolina) found itself cut off from land by a seven-foot alligator sunning himself on the pier. 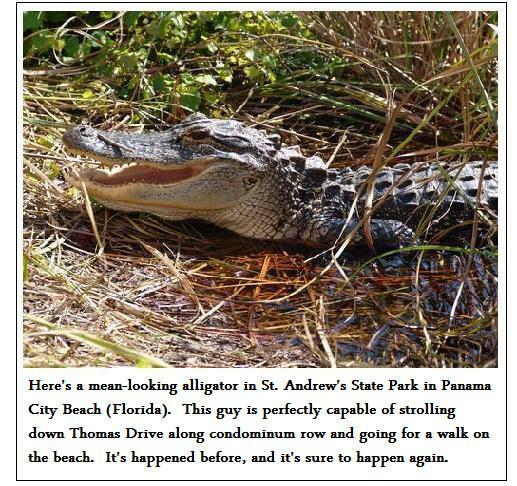 The Sheriff's Department and the Department of Natural Resources were called, but before the gator could be captured, the reptile left the pier and entered the water and swam away. July 28, 2010 -- The current online catalog for Mezlan Shoe Company offers men's alligator leather loafers for prices from $129 to $499. However they offer one pair of alligator loafers at a discount. Formerly priced at $249.99, the loafers are now priced at $89.99. July 28, 2010 -- A ten-foot alligator reported to have eaten at least four dogs has been roaming the drainage system and canals of St. Petersburg (Florida) for two years according to Charles Carpenter, a professional alligator trapper who has made many unsuccessful attempts to trap the monster gator. Now the Florida Fish and Wildlife Commision has authorized Carpenter to use deadly force to rid the city of the big nuisance reptile. Officials feel that it is too dangerous to try any further to relocate the beast. July 27, 2010 -- A woman who was walking her dogs at Riverbend Park in Palisade (Colorado) today reported seeing a five-foot alligator, according to the Palisade Police Department. The park is located on the Colorado River. Police officers responded to the scene but did not see an alligator. Palisade Police Officer Stephen Tonello said the department will keep an eye on the situation. 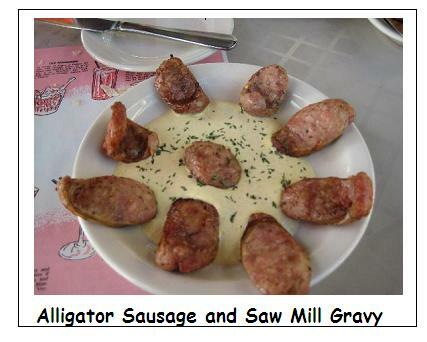 July 25, 2010 -- Here's an excerpt from a Florida traveller's tale: "As I turned to scoop up Chloe, my new dachshund puppy, and click the lanai door shut, not more than a few feet from where we were standing, there was the BIGGEST alligator with his mouth wide open. He was right up to the door! I could barely scream. Clutching Chloe, I ran to wake the family. I knew they weren't going to believe this one! And they couldn't. But when they saw the alligator, they didn't know who he wanted to eat, me or Chloe. He wasn't leaving either! My Mom called the alligator control people, who finally caught him and moved him to another pond. 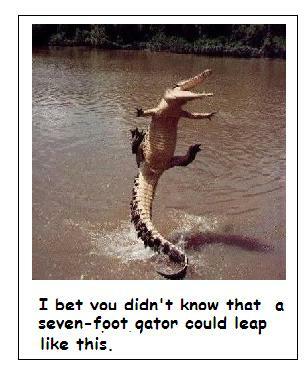 It turns out that the alligator was about eight feet long!" 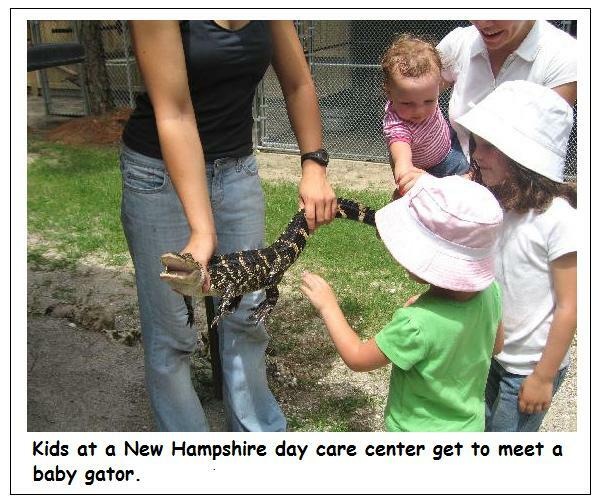 July 24, 2010 -- Alligators are turning up as far north as Middleboro (Massachusetts). State police were left babysitting an alligator on Friday night after a fisherman hauled in a baby gator from a local fishing hole along the Nemasket River. It's not the first time one of exotic creatures has been fished out of a waterway in town. In 2005 Det. 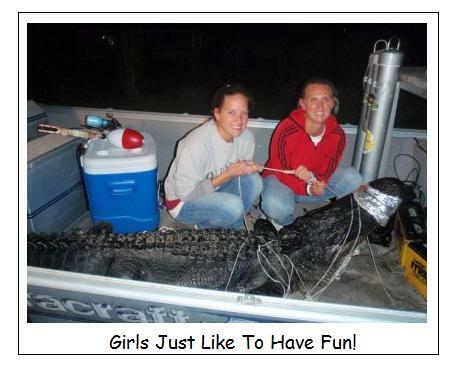 Simonne M. Ryder lured a 52-inch gator out of Stump Pond with a hunk of chicken. 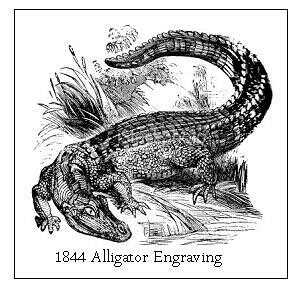 That same year a gator was pulled from Waldo Pond at D.W. Field Park in Brockton after a city resident spotted the reptile from the shoreline. In May of this year another was spotted at D.W. Field Park. 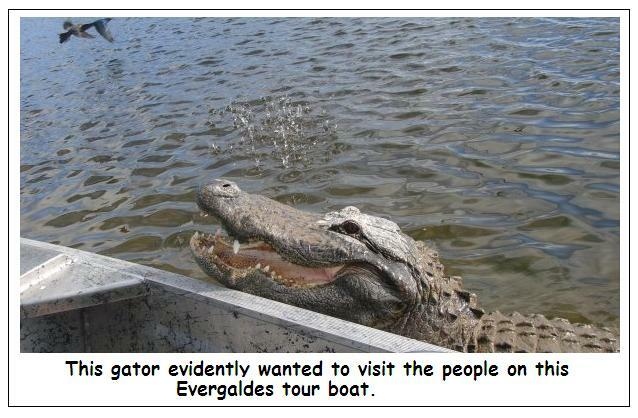 The alligator sighting was investigated by environmental officials but the beast was never found. Gators have been turning up in town since 2004 when a 6-foot alligator surprised firefighters as it lumbered out of a South Main Street apartment that was on fire. 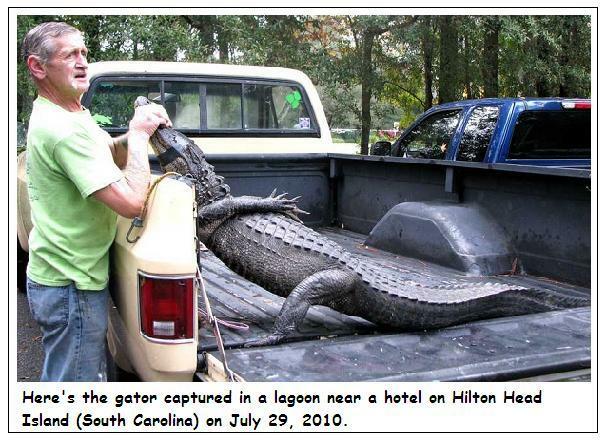 July 23, 2010 -- During a drug bust on Reed Road in Center Point (Alabama), Jefferson County Sheriff Department officers discovered a pet alligator in the residence. 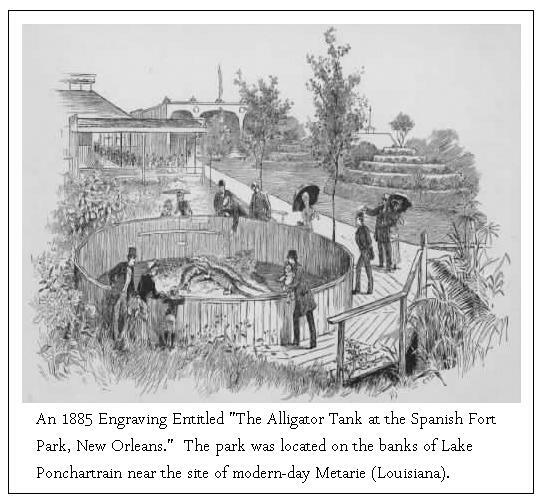 Private ownership of alligators is illegal in Alabama. The officers also discovered a boa constrictor and a bull snake and lots of cocaine and marijuana as well as an AK-47 assault rifle and several high-powered 9-mm pistols. Somebody is in a lot of trouble. Randy Christian, the Sheriff's Department spokesman, told reporters that he didn't understand why anyone would want to keep a pet that is "big enough to eat you when it's grown and wants to." 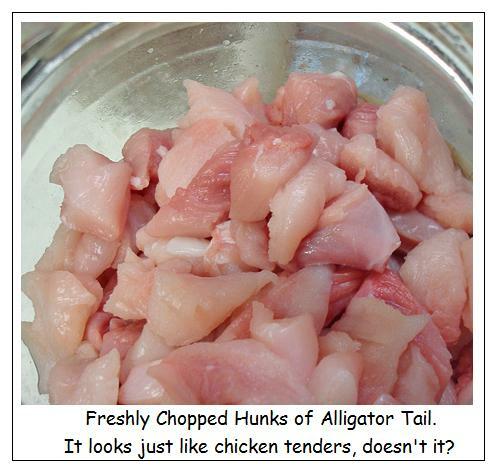 July 22, 2010 -- According to the Crawfish Company website, the best alligator meat comes from the tail. 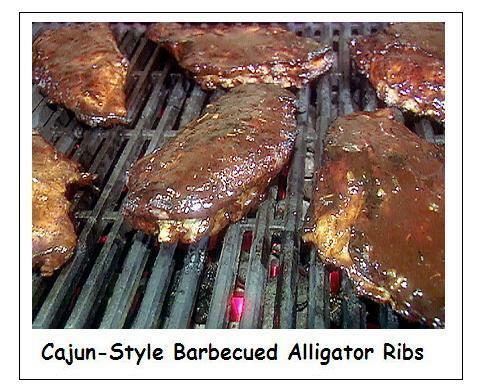 It's boneless and can be cut into steaks perfect for the barbecue grill. This kind of meat currently goes for $49.95 per five-pound minimum order. 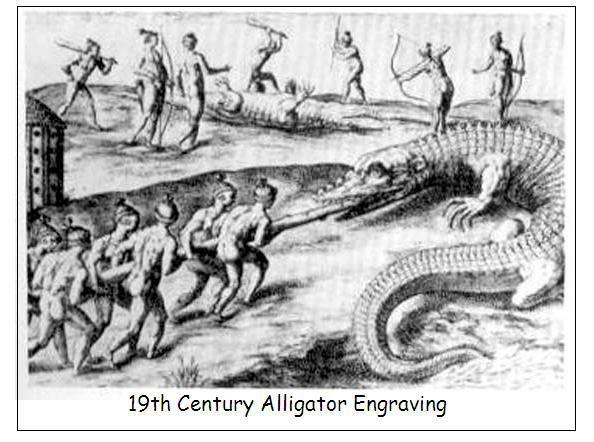 July 22, 2010 -- State-wide in Florida there are about 46 calls daily reporting alligator nuisances; about 16 of the daily calls involve capturing and relocating the gators. 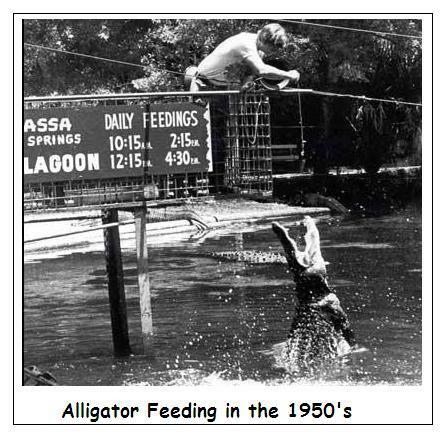 July 22, 2010 -- High Springs (Florida), not too far from Silver Springs (where the famous glass-bottom boat tours are held), was the scene of a serious gator attack on this date. A researcher snorkeling in a pond to check underwater scientific metering devices was attacked by an 11-foot-long 500-pound alligator that bit him on the head and neck. He is expected to make a full recovery after his week in the hospital. 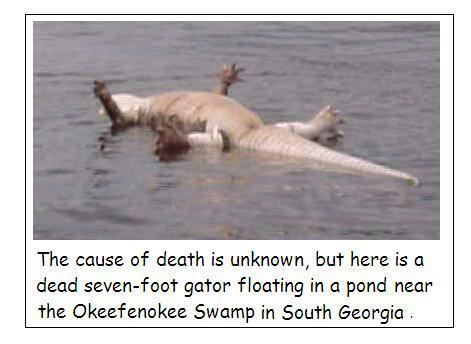 July 21 ,2010 -- A nine-foot alligator was killed just outside the town of Jemison in Shelby County (Alabama) a couple of days ago. 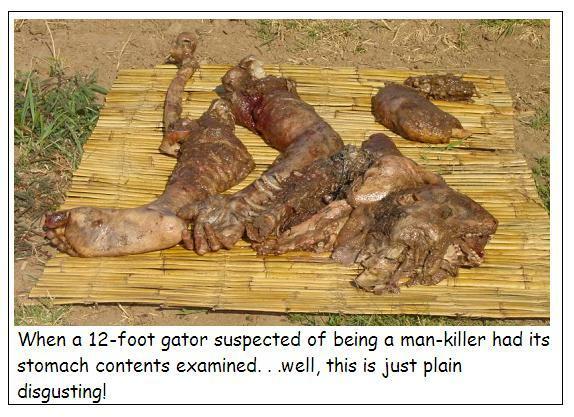 The gator evidently was shot by animal control officers who were unable to capture the beast for relocation. An American alligator that long can easily weigh over 350 pounds. July 20, 2010 -- On the front page of The Birmingham (Alabama) News for this date is a large picture of of four or five policeman trying to capture an alligator measuring at least seven-feet-long. After a struggle of some length, the cops captured the beast and duct-taped his mouth shut. 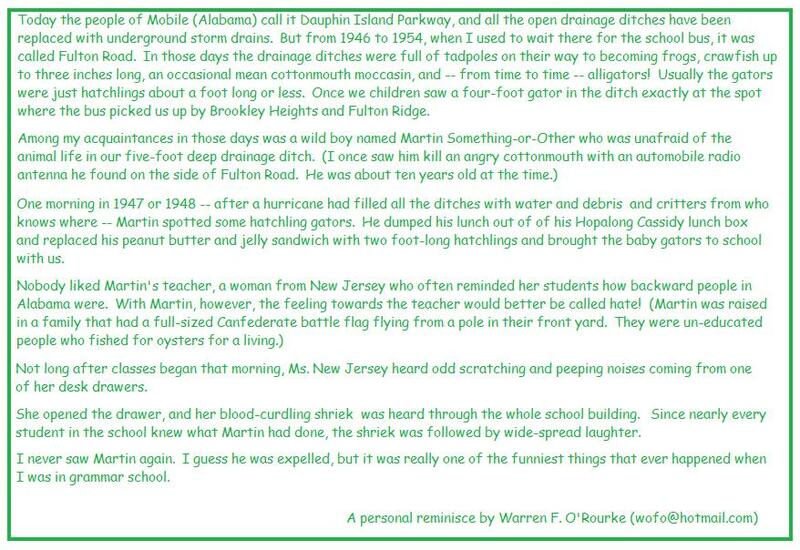 This encounter took place a few miles west of Birmingham (Alabama). 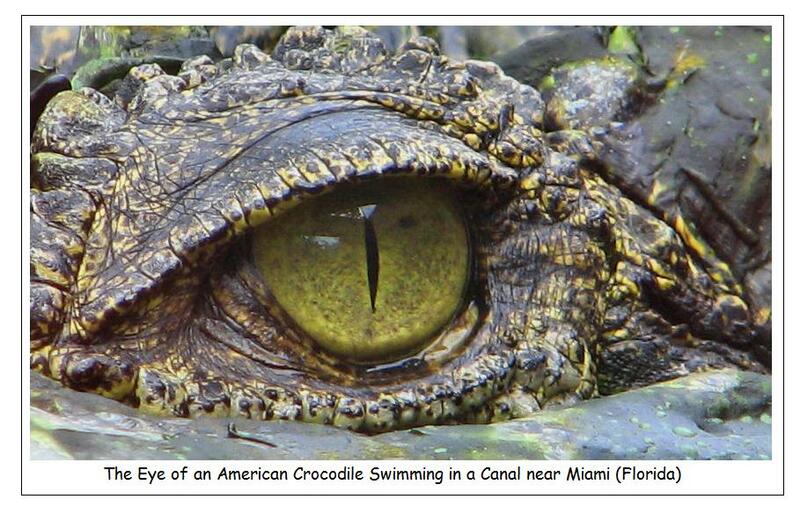 July 19, 2010 -- American crocodiles are an endangered and rarely seen species, so residents of Coral Gables (Florida) were surprised when an extra large croc started making appearances in the town's canals and drainage system. 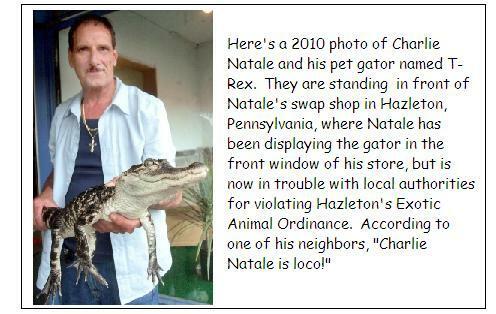 So far the reptile has not been caught and has already eaten one dog right before the owner's eyes. 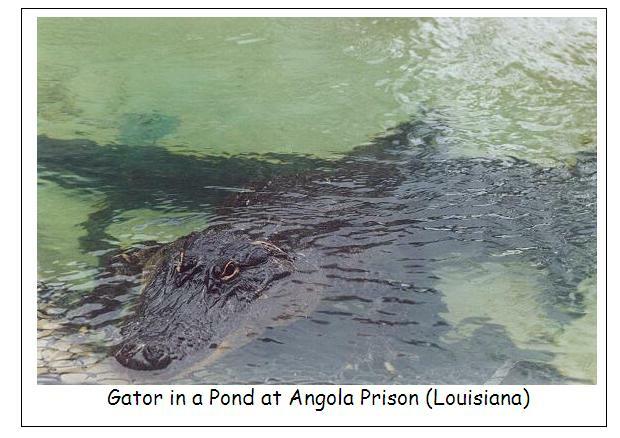 July 19, 2010 -- Alligators used be unknown around Jackson (Mississippi), but recently they are popping up so often that the Rankin County newspaper just published an article which included tips on what to do if an alligator is swimming around in your pool or pond. 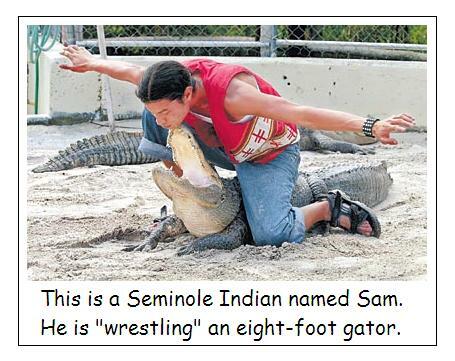 July 15, 2010 -- A man who appeared to be intoxicated saw a small alligator crossing a road in Sanford (Florida) and decided to catch it. He grabbed the animal by the tail and it whirled around and bit him on the leg and then scurried away into the tall grass beside the road. Undaunted, the man started probing the grass with his bare hands. 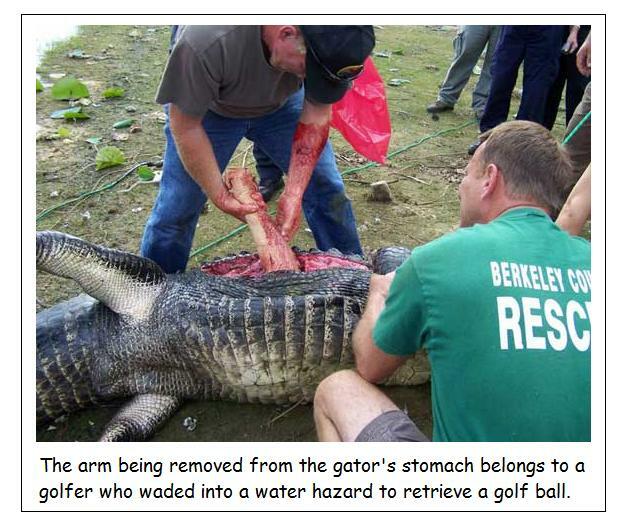 So the gator bit the man again. Eventually the man caught the gator and put him in the bed of his pick-up truck. 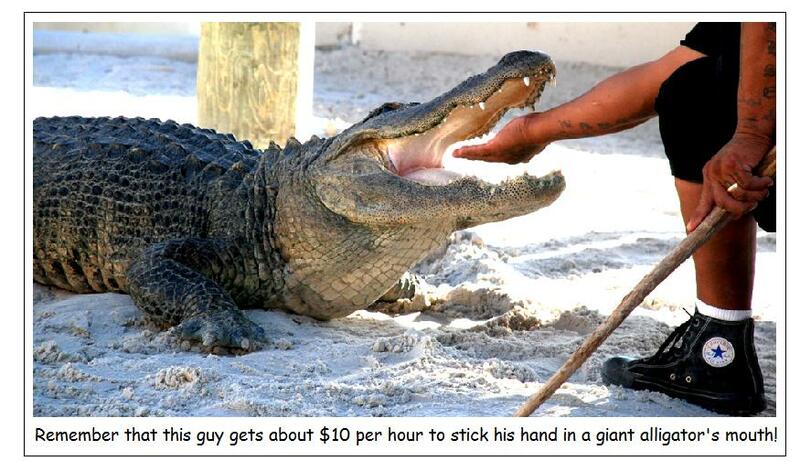 Somebody called the authorities, and the man was cited for illegally possessing an alligator. His evening was capped off by a trip to the local hospital to have his gator bites treated. July 15, 2010 -- A teenager was attacked by a ten-foot alligator and had his left hand torn off when swimming in a popular neighborhood canal near Golden Gate Estates (Florida). 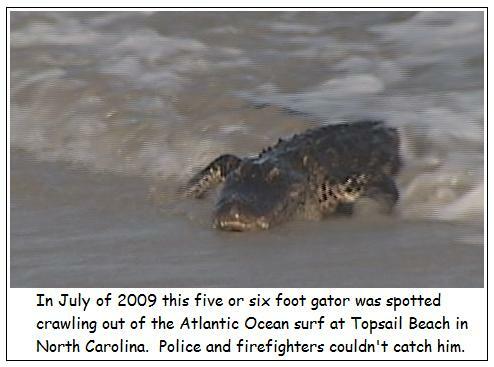 July 14, 2010 -- Several hundred beachgoers at Hilton Head Island (South Carolina) spotted a 9-foot gator swimming through the surf towards the beach. 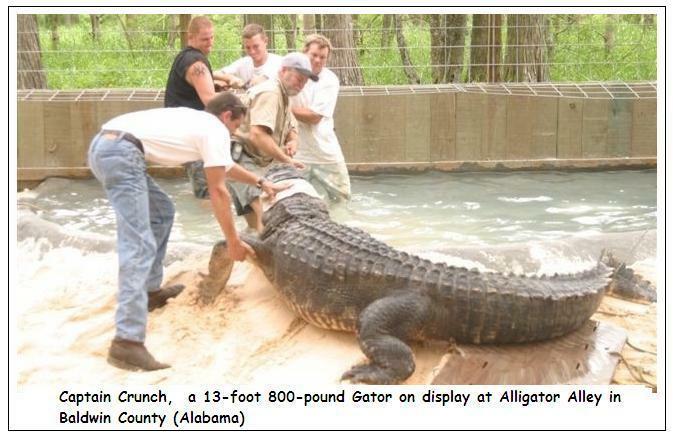 About one hundred people stayed long enough to watch alligator wranglers capture and remove the beast. According the local newspaper, The Island Packet, in recent years gators have been spotted in the surf about once a month! 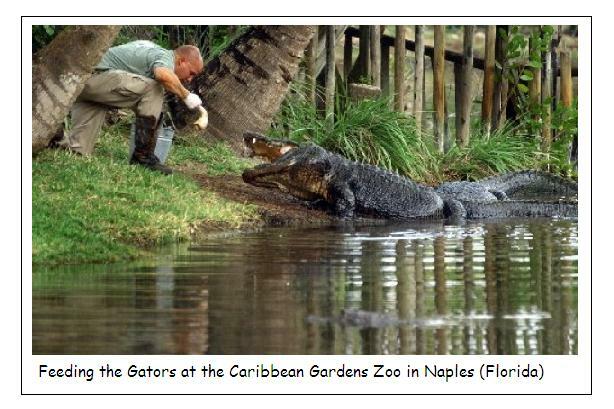 July 11, 2010 -- At Naples (Florida) an alligator attacked a man and bit his right hand off. Local wildlife officials are still searching for the gator. By the way, this is not the same incident that was reported on May 15, 2010. July 5, 2010 -- The Reserve is a nice new neighborhood in Madison (Alabama), a new bedroom community near Huntsville. The neighborhood has an excellent fishing lake. 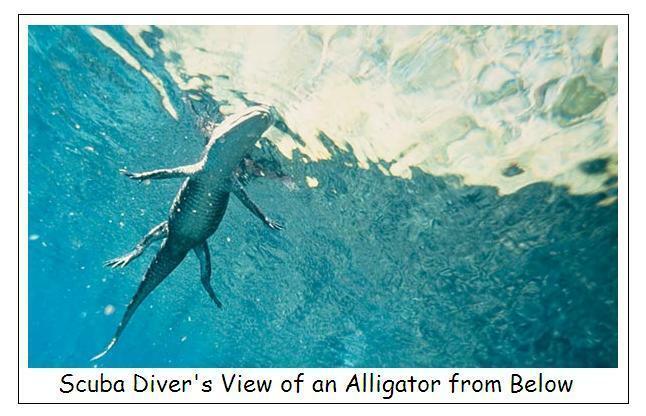 A couple of days ago residents spotted a six-foot gator swimming in the lake. Animal control officials eventually caught the gator and relocated it in the Joe Wheeler Wildlife Refuge on the Tennessee River. Meanwhile the panicky Reserve Homeowner's Association has plastered the subdivision with signs warning people not to swim or wade in the lake. June 10, 2010 -- Summer school students arrived at Stewart Middle School in Tampa (Florida) for what many of the kids initially considered to be a typical school day. 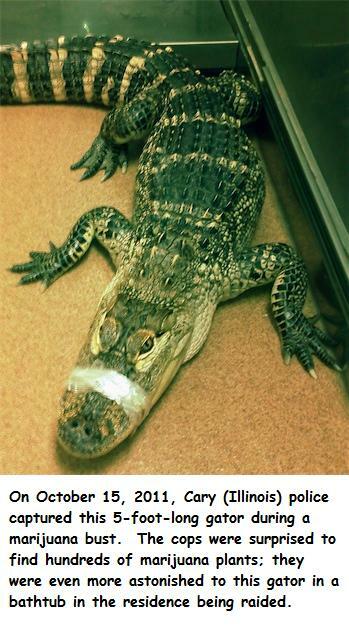 It wasn't until a 7-foot gator was discovered meandering about the school's hallways that they thought otherwise. The animal has since been removed from the premises. May 31, 2010 -- At D.W. Field Park in Brockton (Massachusetts), a five-foot gator was spotted swimming in the park's little lake. Authorities suspect the gator was deliberately released by a pet owner who could no longer cope with caring for a large and still-growing gator. So far, however, no one has been able to capture the reptile. 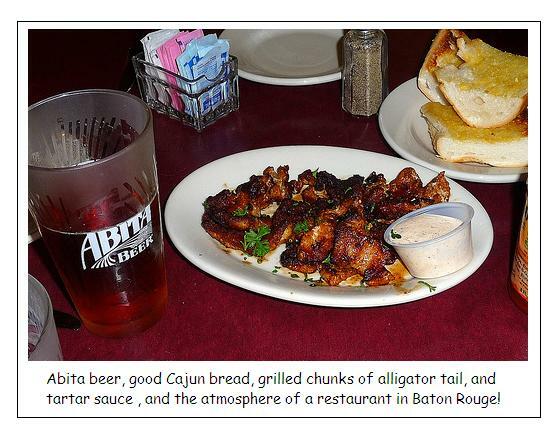 May 28, 2010 -- WBRC-TV News in Birmingham (Alabama) entered the following report on their website: "An alligator caused quite a stir Friday morning for several people in Chilton County. Chilton County Chief Deputy Sheriff Shane Mayfield told FOX6 News a family was leaving home this morning when they encountered the gator in the middle of County Road 131. The alligator would not move, so they called the Chilton County Sheriff's Department. Deputies, along with Jemison's animal control officer, quickly arrived but were unable to capture the alligator, so they called the Alabama Department of Conservation and Natural Resources. An employee with the department arrived and removed the alligator from the scene. 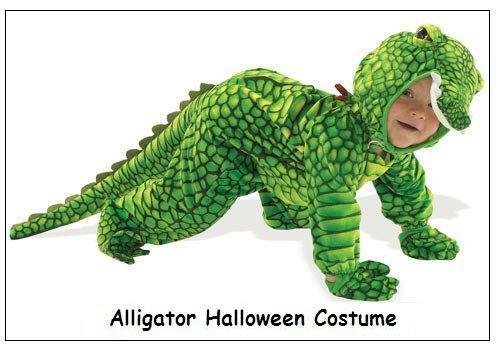 Nobody knows where the alligator came from. No one was hurt. 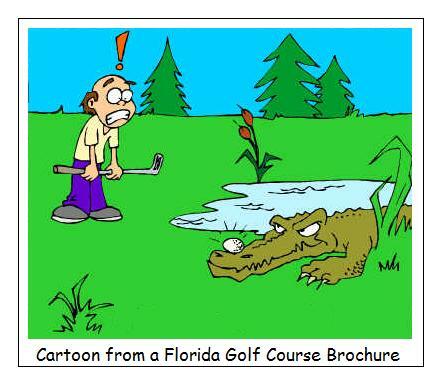 May 15, 2010 -- Attention All Golfers! Today a guy who shanked a ball into the rough beside a canal in Florida had his hand bitten off by a gator. 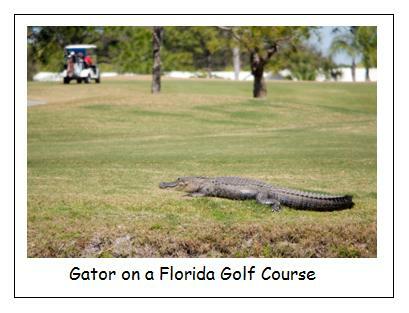 He was poking around in the weeds along the bank looking for the ball when the gator struck. 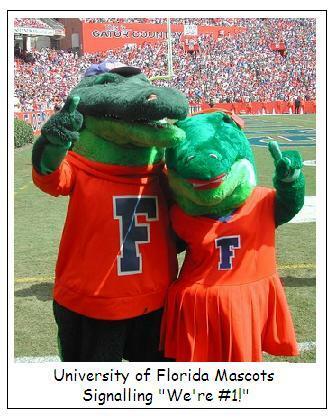 April 19, 2010 -- And there are gators loose as far away as North Dakota. Listen! Authorities are looking for a permanent home for an alligator found out and about on the streets of Fargo (North Dakota). Friday morning police got a call that a two-foot long alligator was walking around outside an apartment building.The people who made the call were able to capture it and keep it in a bathtub until authorities were able to take it away.The alligator's temporary home is the North Dakota State University zoology department. It will stay there until officials find it a permanent home. Authorities believe someone had the alligator as a pet and got rid of it once it got too big. April 6, 2010 -- Refugio County (Texas) Game Warden Raul "Pinky" Gonzales found out the hard way that gators remain very dangerous animals. 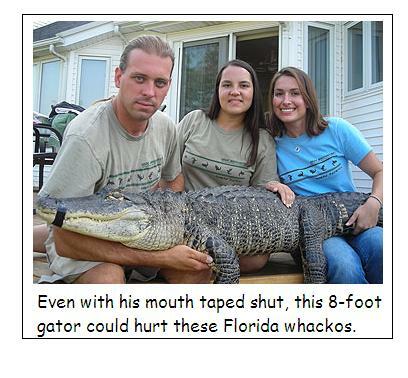 Gonzales is recovering this week from injuries suffered in a struggle with an 8-foot, 9-inch alligator. The incident began on Friday, April 2, when Gonzales responded to a call about an alligator on FM 136 just south of Woodsboro. 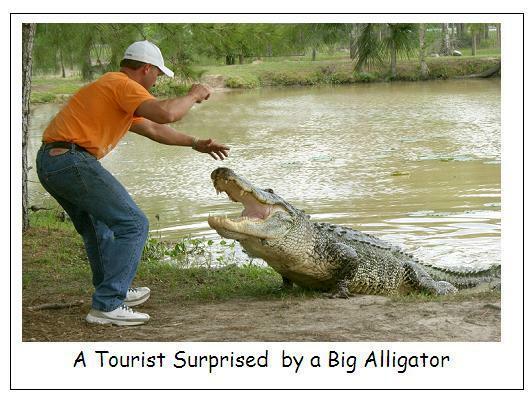 He arrived to find the big gator in the middle of the road. Attempting to relocate the animal, the warden got on top of it and began to tape its mouth. 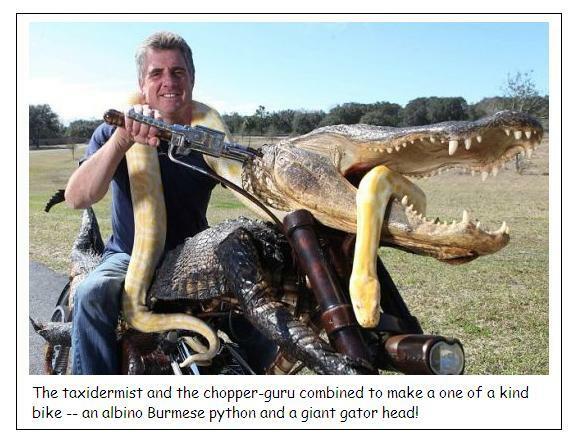 Although he has dealt with alligators for more than two decades and has never been injured, this time was different. 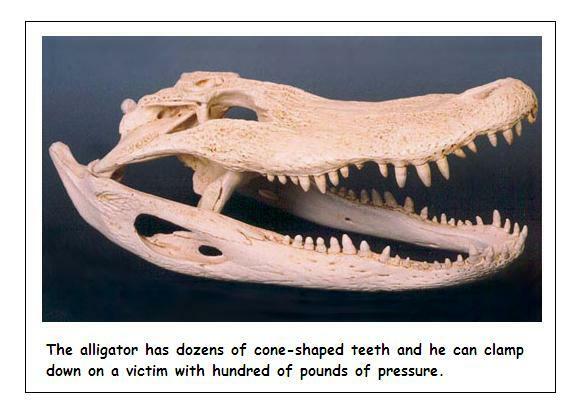 The alligator swung its head and struck Gonzales squarely in the face, causing a severe cut to his upper lip, breaking a tooth, loosening another, and damaging his eyeglasses. Gonzales immediately tried to get away, but the agitated reptile bit him on the hand. Gonzales managed to draw his service pistol with his uninjured hand and got off a couple of shots which killed the gator. Gonzales spent the next 24 hours in ahospital being treated for the wounds and possible infections. March 22, 2010 -- After heavy rains in Georgia washed debris of all kinds many miles out into the Atlantic Ocean, officials of Georgia's wildlife service were surprised to find a five-foot Georgia freshwater alligator swimming in the salt walter twenty miles out to sea. July 11, 2009 -- According to Tennessee state wildlife officials, it's illegal for private citizens to import or own alligators as pets. When illegal gators are found, the state officials sieze the gators and try to find them proper homes. 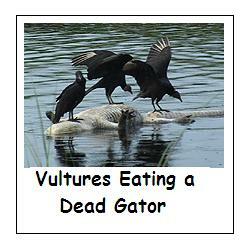 But recently there have been so many gators found that the state will now euthanize gators that are seized. 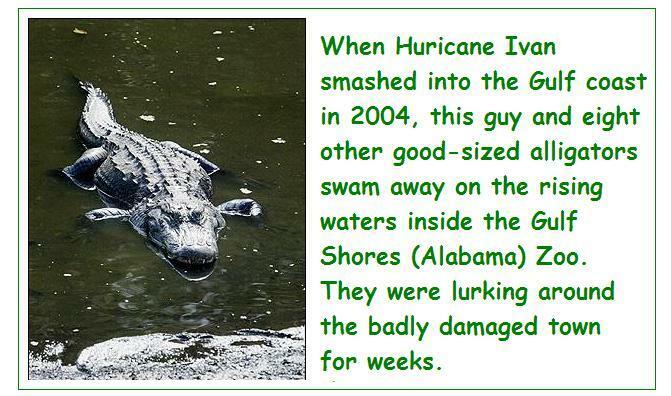 June 11, 2009 -- According to WALA-TV, a 12-foot gator swam up through the surf onto the crowded beach of Dauphin Island (Alabama). The beach-goers quickly vacated the beach and wildlife officials were called to the scene where they decided to euthanize the big gator. A spokesman said that the alligator was blind and had been injured by a boat propeller and was therefore too dangerous to try to relocate. 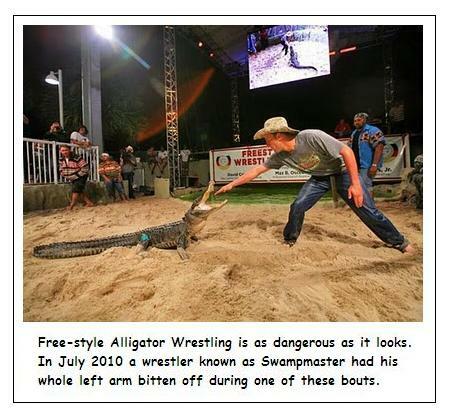 April 18, 2009 -- According to a web article, "alligator wrestling" is more like bull-roping than human wrestling. 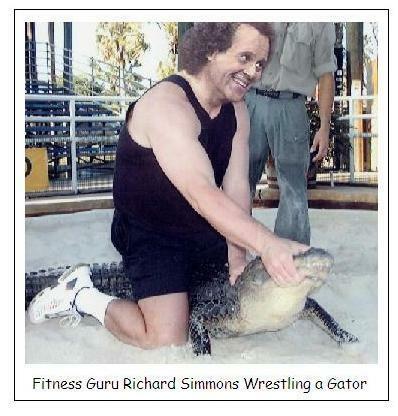 The object is to bare-handedly subdue a gator long enough to tie his jaws shut with a piece of rope. 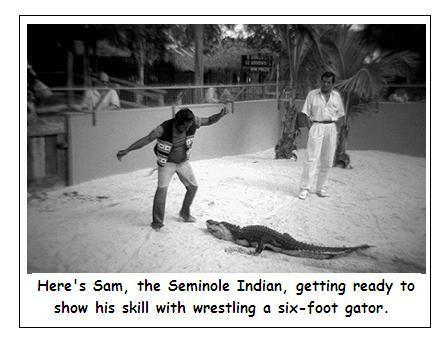 Along the way the wrestler talks about gators with his audience and takes risks such as sticking his head near the gator's open mouth. 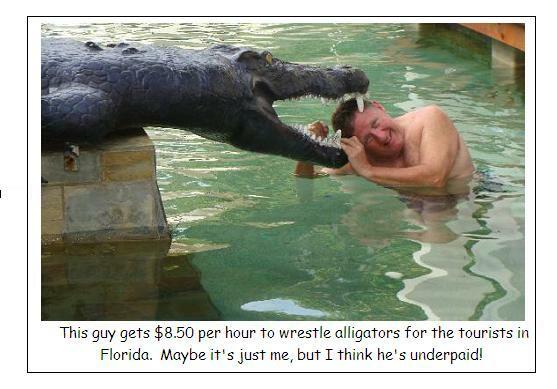 Typically an alligator wrestler is paid $8 to $10 per hour to practice a very dangerous sport. September 13, 2008 -- Hurricane Ike deposited huge piles of debris on the shores around Galveston (Texas). During the clean-up, workers found a live and healthy juvenile alligator in one such pile. 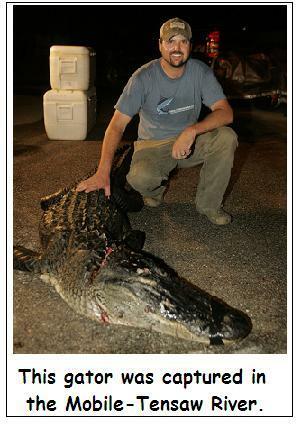 Interesting because the little gator had been tagged by conservationists in an area of Louisiana about 300 miles away from Galveston! 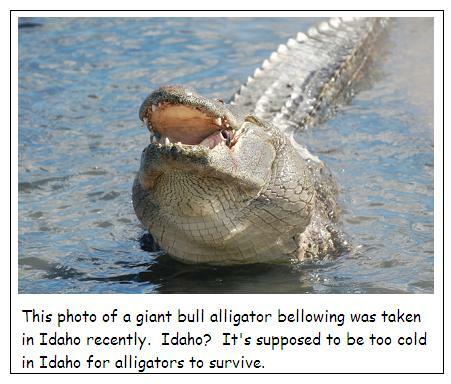 Gators are very hardy and can survive all sorts of conditions. July 25, 2008 -- A visitor to Florida from Ohio was walking her Cairn Terrier on a walking path in Tampa's Al Lopez Park. She let the dog off the leash to run free for a while. The dog came too near the park pond. 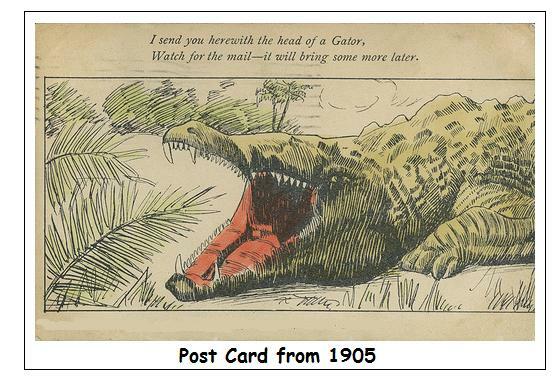 In the blink of an eye, the terrier was eaten by a large gator. July 18, 2008 -- Conservation officials removed a ten-foot alligator from a private pond in Danville, a small community near Decatur (Alabama). 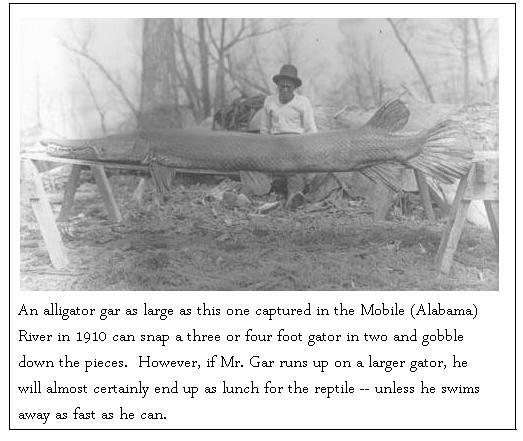 In the 1970's, 55 Louisiana alligators were introduced into north Alabama to control the beaver population, so folks in that area no longer see many beaver dams. 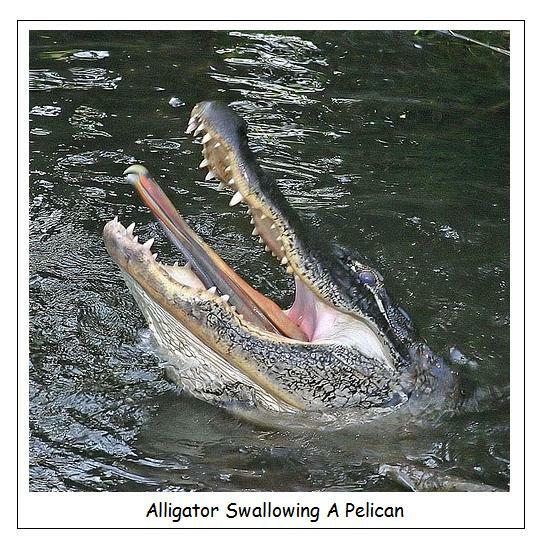 For the past thirty years they have been spotting alligators all along the Tennessee River at places like Point Mallard and the Joe Wheeler Wildlife Refuge. 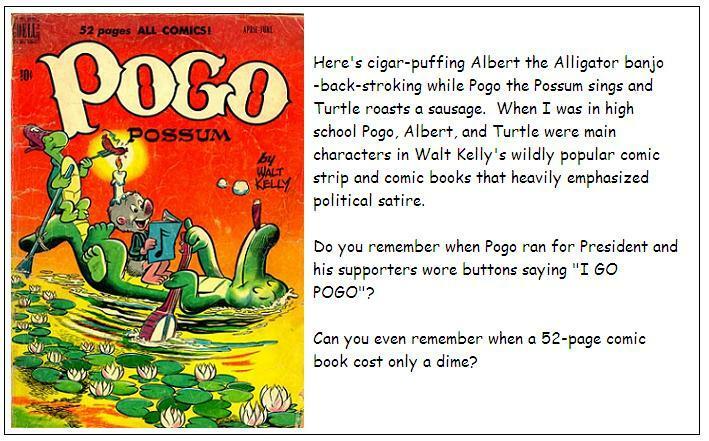 The original 55 gators were supposed to wipe out the beavers and then die in the bitter cold Alabama winter. 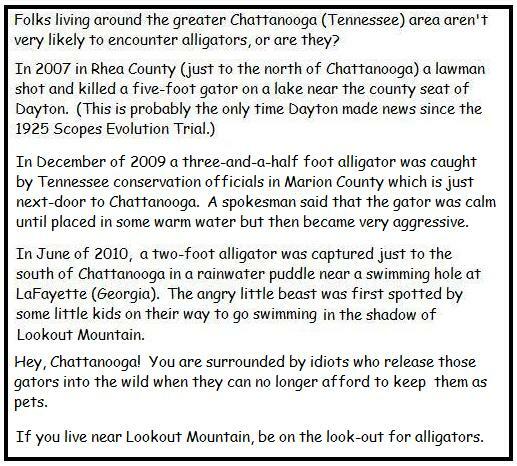 Instead, after dispatching most of the beavers in the area, the reptiles adapted to the Tennessee River environment. 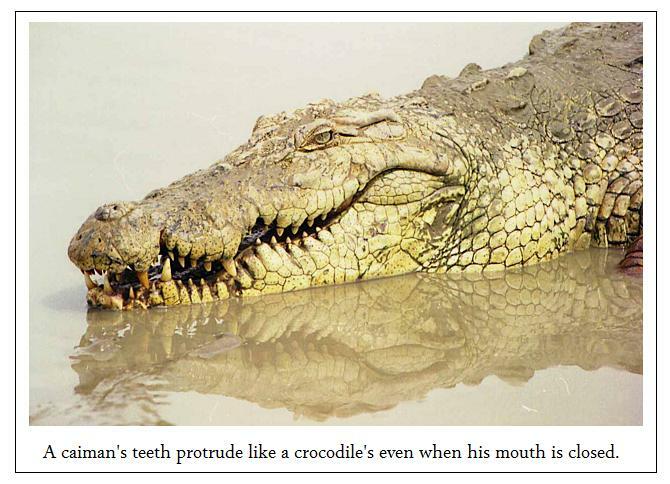 July 17, 2008 -- A Frenchtown (Delaware) man has claimed that he was almost bitten by a crocodile or alligator while fishing in the Delaware River in Kingwood Township. According to State Police spokesman Sgt. Stephen Jones, the 26-year-old fisherman was fishing in the river at the Kingwood Township recreation area in shallow, muddy water. 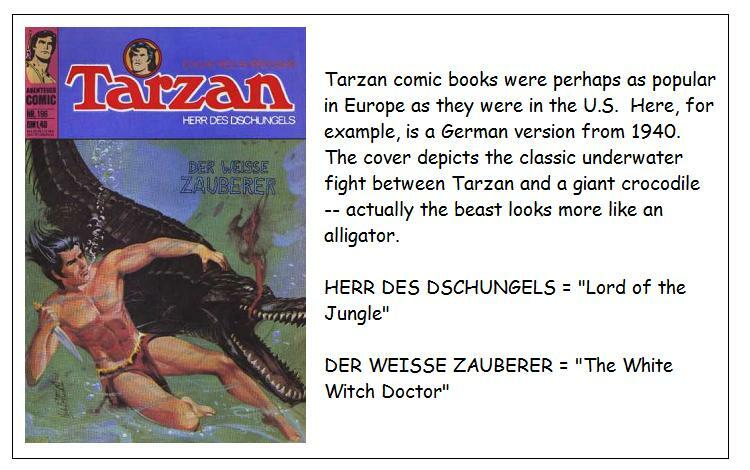 The fisherman said the beast which tried to chomp him was four to five feet in length. TPolice notified boaters and hikers in the area and asked them to spread the word. The DEP was also notified. Police have not received any reports of the creature since. 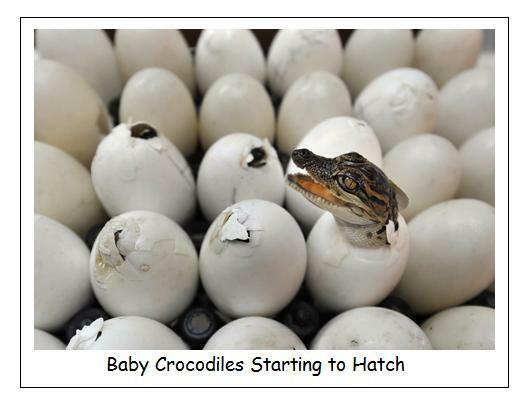 Crocodiles and alligators, of course, are not native to the Delaware River, preferring much warmer climates. Delaware Riverkeeper Maya van Rossum said she has never heard any report of such animals living along the river, but said it could be possible that someone would have one as a pet, decide they didn't want it, and abandon the animal near the river. Sgt. 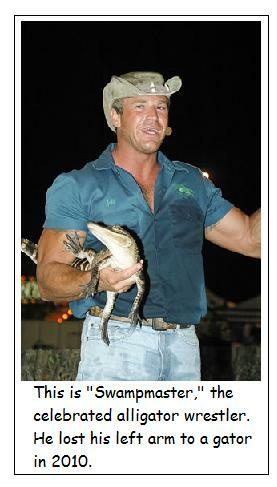 Jones pointed out that a pet alligator was recently confiscated during a drug bust in nearby northern New Jersey. April 23, 2008 -- A Brookline (New Hampshire)fisherman was astonished when he found a five-foot gator hooked on his line while casting for fish in that town's Melendy Pond. 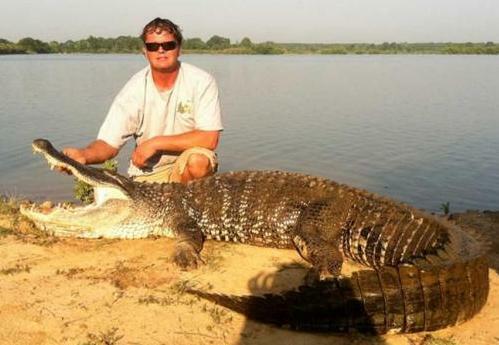 He said that the gator lunged at him, trying its best to bite him as he tried to keep the reptile on his line. Another nearby fisherman called 911; but by the time the authorities arrived, the gator had broken the light fishing line and had escaped. An official spokesman said that the alligator must have been a released or escaped pet and that private citizens are not allowed to own alligators in New Hampshire. November 13, 2007 -- According to the Miami-Dade County (Florida) Medical Examiners Office, Justo Padron, 36, while fleeing from police, attempted escaping by jumping into a pond adjacent to the Miccosukee Resort and Convention Center and was promptly killed by a 9-foot alligator on this date. Padron and an accomplice were suspected of burglarizing cars in the parking lot of the resort which is located at 500 SW 177th St. in Southwest Miami-Dade County. When police closed in, Padron attempted to swim to freedom through the pond on the convention center property. Witnesses said they could hear Padron screaming before he disappeared underwater. October 5, 2007 -- Gwen Williams, 83, was from Canada. Her body was spotted floating in a lagoon 500 feet behind her daughter's pricey house by a couple riding by in a golf cart at The Landings on Skidaway Island, an upscale development east of Savannah (Georgia). 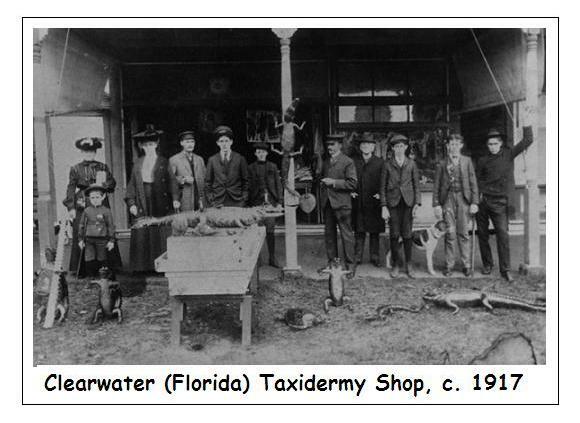 Autopsy results and an examination of the stomach contents during a necropsy of the animal suspected of killing her conclusively established that she had been attacked and killed by an 8 foot alligator. August 19, 2007 -- When you drive south to Mobile (Alabama) on I-65, you cross into Mobile County from Baldwin County by overpassing a huge complex of a rivers and swamps. Every August local people have a big alligator hunt in this swamp. 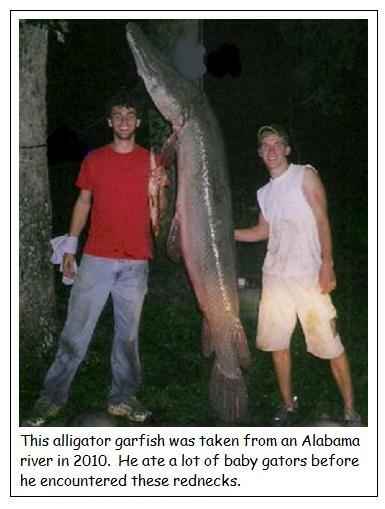 The image just below this entry shows a twelve-foot gator captured around nightfall in August of 2007. His mouth is taped closed with black electrical tape. 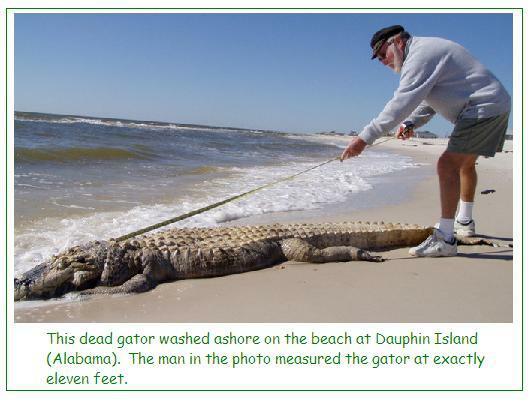 April 29, 2007 -- Here's an Alabama beach-goer's alligator tale from a blog entitled City-Data.Com: "I was at Dauphin Island (Alabama) and saw what I thought was a dead alligator in the surf. You know, the shallow surf where toddlers play. I was thinking about grabbing the tail and hauling the 10-foot gator out of the water, dreaming of the boots and belt I'd get made; but I decided to watch it a minute. (I felt safe! I had my cooler with me!) To my surprise, the gator started moving towards me. I watched it crawl into the dunes." 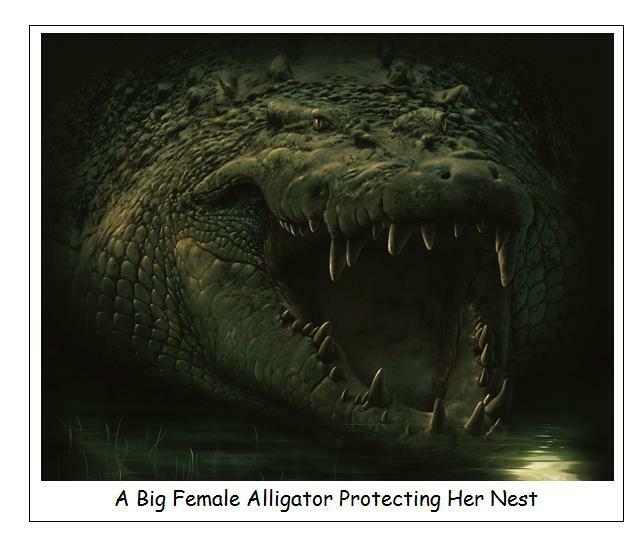 March 12, 2007 -- It's illegal for private citizens to own alligators in Vermont; so when somebody tipped wildlife officials that a Vermont family was keeping a 125-pound gator in their basement, the authorities showed up and confiscated the animal. No charges were filed against the home-owner because he cooperated. Damn! He was probably happy to be rid of the beast. May 18, 2006 -- A giant 700-pound, 12-foot-long alligator was captured and pulled from a Florida canal after fearful residents called for help. A crane and several men were needed to lift the alligator out of the canal located in Doral (Florida). Homeowners in the area complained about the alligator, saying it had become a nuisance. A professional gator trapper said the alligator was definitely not one residents would want in the area, according to the report. "This is the biggest alligator ever caught in Miami-Dade County," Local TV-6's Jacquie Sosa said. Meanwhile, trappers in Marion County, are confident they captured the nearly 12-foot alligator responsible for killing a 23-year-old woman snorkeling in a remote river, according to local TV-6 News. Annemarie Campbell, 23, of Paris, Tennessee, suffered lacerations on her head, neck and upper torso and suffered multiple rib fractures during the alligator attack over the weekend. Campbell was found in the alligator's mouth. 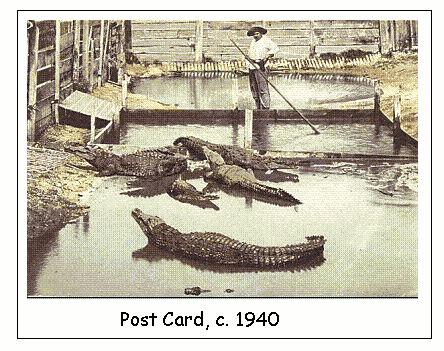 The bull alligator believed responsible for the attack was captured on a hook at Juniper Run four days later. The hunt also turned up a second large alligator. 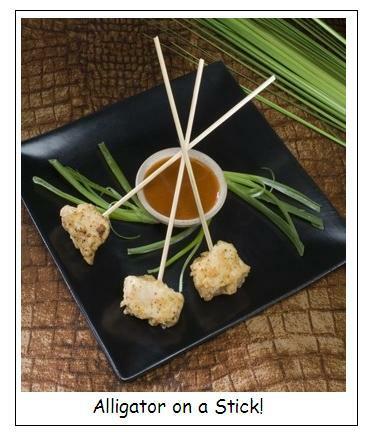 Both alligators were killed by bang sticks to the head. (A bang stick is an underwater defensive weapon consisting of a long metal tube fitted at one end with a powerful handgun round such as a .357 Magnum round. The user of a bang stick places the stick in contact with the head of the beast and discharges it with lethal effect.) Trappers said with the size of the alligator, Campbell did not have a chance. "She would not have had any chance at all," trapper Curtis Lucas said. "I mean in the water, he has all of the advantage. That is his home ground. He was made to operate and move in the water. She had absolutely no chance." April 9, 2005 -- Late one afternoon, an Orlando (Florida) couple was feeding the ducks on a pond near their residence. Their spunky little Jack Russell terrier was chasing the ducks along the bank when a gator popped out of the pond and gobbled the little dog up.